Old Testament - Great chapter today! We are introduced to Elisha, who will be mentored by Elijah to succeed him as a prophet at the end of First Kings 19 today. However, before we get to Elisha, we read about Elijah being very "dejected" in the desert to say the least. Some commentaries on this early portion of chapter 19 are not super-kind to Elijah for heading to the desert. Commentaries I think wisely suggest that verses 9 & 13 demonstrate God trying to gently let Elijah know he's off course and feeling too sorry for himself, when asked twice in these verses: "What are you doing here, Elijah?" This kind of reminded me of Jonah fleeing from God's will on the boat. (which we'll read about later this year). And this kind of reminded me of me - and maybe you too. :) Have you ever had that nagging question enter your heart or mind when you suddenly realize that you are off course from God's will in your life? That question of: "What are you doing here??" I know I have... Praise God when we are actually able to hear and understand that question and get out of the desert and back to life and back to loving this hurting world! 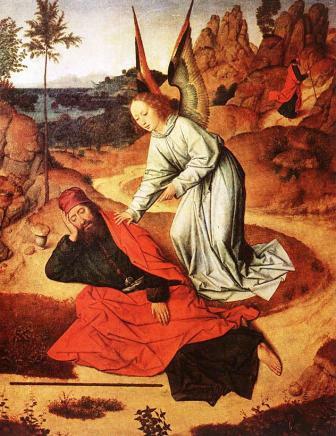 Below is a wonderful painting from the year 1464 by the Flemish artist Dirk Bouts for verses 5 & 6, early on in the chapter when Elijah was fleeing to Mount Sinai - "Then he lay down and slept under the broom tree. But as he was sleeping, an angel touched him and told him, "Get up and eat!" He looked around and saw some bread baked on hot stones and a jar of water! So he ate and drank and lay down again." Today in 1 Kings 19 verses 11 through 14 we read about how God appears to Elijah in a way that he was not expecting – “Then a great and powerful wind tore the mountains apart and shattered the rocks before the LORD, but the LORD was not in the wind. After the wind there was an earthquake, but the LORD was not in the earthquake. After the earthquake came a fire, but the LORD was not in the fire. And after the fire came a gentle whisper. When Elijah heard it, he pulled his cloak over his face and went out and stood at the mouth of the cave. Then a voice said to him, "What are you doing here, Elijah?” The interesting thing to note about these verses is that Elijah was expecting or hoping God would appear in judgment to the Israelites in a windstorm, earthquake or fire. But God did not appear in any of these forms. Instead, God comes to Elijah in a simple gentle whisper. A gentle whisper. And I wonder about us in our lives today as well – do we often expect God to move mountains or to really show himself to us in big bold ways? When, perhaps, God may be speaking to you or me right now, but we’re missing it? Why? Well, is it possible that God is speaking to you right now with a simple gentle whisper? Is it possible that you have built up so many distractions or duties or activities or worries in your life that you cannot hear God’s gentle whisper? I know that I have been in this place too many times – I’ve gotten myself so busy looking for God in all the wrong places. And then finally I will slow myself down for just long enough to hear God speaking to my heart in a gentle whisper! A gentle whisper that I am sure was there all along. . . but I was looking for God in the windstorm and earthquake and fires of life. When instead I should have simply slowed down and listened for God’s gentle whisper. Will you slow down long enough to listen for God’s gentle whisper for you? Do you believe that God can speak to you in a simple gentle whisper this very moment? 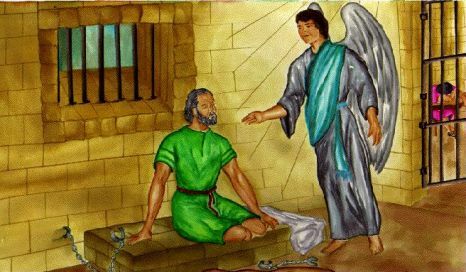 New Testament - There is a lot going on in today's Acts readings as Peter is freed from jail by an angel! I love verse 5 in this chapter as Peter was put in jail - "But while Peter was in prison, the church prayed very earnestly for him." Who are you praying for very earnestly these days? Do you think that prayer changes things? 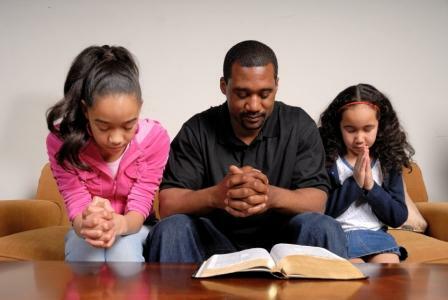 How is your prayer life this very day? Verses 21 through 23 are a great great reminder to not ever accept anyone calling you a god - nor for you to every think of yourself as a god - "When the day arrived, Herod put on his royal robes, sat on his throne, and made a speech to them. The people gave him a great ovation, shouting, "It is the voice of a god, not of a man!" Instantly, an angel of the Lord struck Herod with a sickness, because he accepted the people's worship instead of giving the glory to God. So he was consumed with worms and died." We should never accept worship from others. The glory should always go to God. As the Psalmist so wisely and worshipfully says in Psalm 115:1, "Not to us, not to us, O LORD, but to your name be the glory." Bible.org's commentary on today's Acts readings titled "The Death of James and the Deliverance of Peter" is at this link. Psalms - Psalm 136 is a liturgy of Praise to God as Creator and Redeemer. A Levitical priest singer likely led the recital, while either worshippers or a Levitical choir responded with the refrain. Cool Bible factoid here - the response "His love endures forever" is repeated 26 times in this Psalm, which is the numerical value of God's name "Yahweh" - back when Hebrew letters were also used as numbers. A lot of intricacies went into the Psalms... some of which do get lost in translation from Hebrew to English. Below is an image of the Hebrew letters yud, hey, vav, hey -- often depicted in English as YHWH or Yahweh -- spelling the name of God. Proverbs - Proverbs chapter 17 verse 14 today is a great reminder that the best way to end a quarrel is to stop it before it starts! "Beginning a quarrel is like opening a floodgate, so drop the matter before a dispute breaks out." 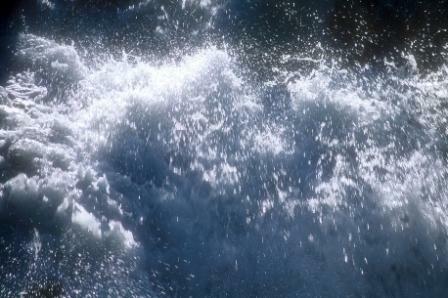 Once the quarrel starts, the waters can quickly flow out of control like a flood. Is there a simmering matter in your life that you need to address quickly and head-on before it breaks out into a quarrel? Before the floodgate opens? It might not be obvious but I find it very interesting the way 'the church met' in Acts 12. Apart from the wonderful story of Peter's deliverance I love that the church was meeting in Mary's house, 'where many gathered for prayer'. Acts 12:12-14. In the early days of the church it was just normal to meet as a church in people's homes. Today it amazes me that people who are institutionally driven are suspect of these expressions of 'simple, organic church', but here it is right in our faces. The church met in homes. But this isn't the only example. Early in Acts 8:3-4 it says that 'Saul was going everywhere to devastate the church. He went from house to house, dragging out both men and women to throw them into jail." I am highlighting this to affirm those of us who are doing 'home church' but sometimes feel we are not fully legitimate. Don't let the monolithic, CEO driven churches intimidate you. There is a place for those churches too, but the fact is, it was very normal, just like breathing in the early days of the church and up until Constantine, to meet in homes. Elijah had called down a drought, stood as God’s representative as he played the “dozens game” (yo momma is …) with false prophets and asked the folks to choose the God/gods who won out, he had “seen” a small tiny cloud the size of a man’s hand, break a three year drought, and then out ran a kings chariot. Yet at the threat of a woman, he ran or was it the threat? Was it the fact that in spite of everything that God had done and proved to the people that He was the only true God, there were no changed lives? In order for change to happen people must decide to change and I truly believe that, only those looking for truth will redirect their lives to following Truth. The search for Truth comes by way of the condition of the heart. Many people desire to do great things for God, yet when something spectacular happens, we become depressed because we thought wrongly that people would surly change, but they do not. We become so focused on the spectacular that we may miss the voice of God as He whispers to us in a still small tone. Like Elijah, God has to wait until we become do low that we cry out for death. We desire death because we fail to see that our value is not in being an avenue for the spectacular but it is in our obedience to the Word of God. Even when we see not discernable fruit in the midst of the spectacular, that doesn’t mean we are not fruitful. As Elijah stands on the mountain, after being called out by God, and as we stand on our mountain we need to understand that God may use the spectacular, the earthquake, the great wind, the fire to take us to the place where we no longer have distractions to hearing His voice. The windstorm comes to blow the things in our lives that are not anchored down by God’s Word out. Then after the great wind, the earthquake comes to shake off everything that remained after the wind. And after the earthquake is over when we think that nothing is left in us that is not of Him, He sends fire to purify everything that remains. When everything in our lives has been tossed to and fro, when everything has been rocked and boulders of hindrances falls away and when the tremendous heat of the fires of purification burns off the dross, then that still small voice of our great King can be heard. Adversity does not come to destroy us; it comes to reveal the cracks. 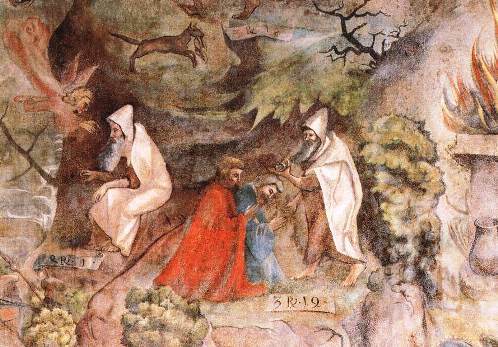 Much has been made of whether Elijah was fleeing Jezebel and her threat of his physical life, or if Elijah was searching for God and a healing of his "soul". 2) There are 23 words in Old Testament Hebrew that indicate "life". "Nephesh" used in vs. 3 seems to indicate "soul, self, life" in other words - 'the inner man'. So it seems Elijah might have been running for his very "soul" perhaps after having a crisis in faith when the spectacular works failed to have an effect on the King, Jezebel, and/or the people of Israel (in a lasting way). Reminds me of Peter walking on water in Matt 14. As soon as he got distracted by the events around him, Peter began to sink. He cried out, "Lord, save me". Perhaps this running into the desert is Elijah's silent cry as he was emotionally sinking - 'Lord, save me'. It is not said that Elijah consulted God when he set out, and in his first prayer recorded in the trip - Elijah prayed that he might die. Not without precedent. When Moses was physically and emotionally spent - he made the same request of God. (Num 11:10-15). God responded by ignoring the request and telling Moses what He would do: provide additional "judges and meat for the people". God was going to provide some relief for Moses' physical and emotional burdens. God did the same for Elijah. God ignored the request and provided what Elijah needed for his physical and emotional burdens - restful sleep and food. Kind of neat, if this was the case. The first time the Word of the Lord came to Elijah - it seems it was in normal tones. Asking 'WHAT are you doing here'? A question much like Adam's in the garden (Where are you?). It gave Elijah a chance to unload. Maybe there is a little something like the stubborness of Peter here - but I wish we knew the tone of voice of Elijah - because I sense his response the second time may have been a bit more "subdued and plaintive". God also encouraged Elijah with a word about "the remnant". When times are dark, God is remarkably consistent. There is always a remnant of believers. It was true then, we will see it to be true later, and it will be true in the End Times. Elisha becoming an "attendant (servant)" of Elijah is the same Hebrew word used for Joshua's relationship with Moses. I know that fear is not of God because Paul told his spiritual son, Timothy, “For God has not given us a spirit of fear, but of power and of love and of a sound mind. 2 Tim 1:7)” So we need to be like Nehemiah as he supervised the rebuilding of the wall, we need to have a trowel in one hand and a weapon (spiritual) in the other so we protect that which we have been ordained to build. Several years ago I once heard a wonderful message about Elijah’s time in the cave. The message was taught to be used as a pattern when we become depressed and suicidal, like this great prophet of God. First God will always allow you to get much deserved sleep and rest and which will sustain you for your journey to your cave. Once at the cave he will send hurricane force winds into our lives to blow away those things and people in our lives that can be and need to be blown awayt. After the hurricane, He will send an earthquake to shake loose the things and people left over from the hurricane. Then and only then will he send the fire of purification to refine and burn off the dross of that which remains. When the hurricane is gone, when the earthquake has passed and when we our purified the still small voice of God will have unrestricted access to our hearing. So get ready to Rock and Roll and feel the heat! This passage always reminds me that we can spend all night pouring our hearts out to God yet when God answers are prayers we do not recognize the answer. This has happened to me several times and I wind up asking for forgiveness because I’ve used what I’ve prayed for without thanking God because I didn’t recognize my answer when it showed up. Do we do this, yes you, we, us Christian, do we do this when one of our own does something atrocious and we justify their behavior at the expense of the ones they have killed, harmed or maimed? What I’m talking about is not offering forgiveness and mercy, but totally ignoring the victim. The Hebrew word Shalom, peace, is not just a nice a word that means we make nice and forget that we may have caused someone grievous pain it means to restore to reconcile to make whole. [Baker's Evangelical Dictionary of Biblical Theology] Without that reconciliation there is no peace, no Shalom. When do we close our mouth to preserve love and when do we not close it? Well for me, unfortunately I've come across an example. Today person A told me that person B feels like i'm not supporting them on something, i dont know why, something person B thought I said or something i failed to say or do. So I told person A this wasnt so. So person A asked me not to tell person B that i they told me. ugh! Now I feel burdoned because person B is maybe hurt so i want to correct the matter. But person A didnt want me to tell person B that they mentioned it to me. So what do I do? now i'm kinda mad A & B were talking about me and maybe B will hold resentment toward me. however if I confront B, then B will be hurt that A betrayed a confidentiality. This was something they were discussing amongst themselves and I didnt need to know it. Person A should have kept his mouth shut! now there is potential for a fight...hopefully not. If I dont say anything to B I will be burdoned. If I do say something, no matter what B will be mad that A said something. They are my family members and there is always this chance they have ulterior motives, to make themselves look better and make me look bad....cause i'm sure we all know thats how many families are, unfortunately. Somehow, seems person A tries to start quarrels among B and myself. B is my sister and A doesnt get along with his sister, they cant hardly be in the same room. so maybe A is trying to rile things up so he doesnt feel as bad about his own relationship troubles. I dont know. 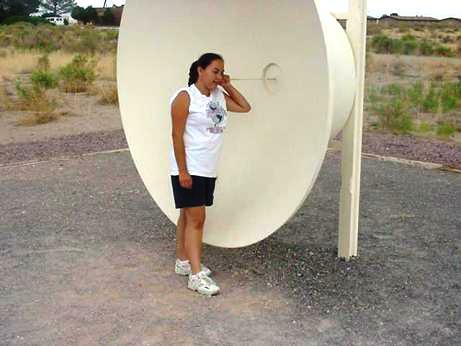 i just know ppl should not gossip!!! Myself included! I decided I will confront B. I'm not carrying around a burden bcos someone cant refrain from gossip. this will be a lesson to A, if you dont want people to know you told them something, don't tell them!! So many great stories in today’s readings! We have Elijah feeling depressed, fearful, defeated. I always loved Elijah because I know what its like to just pray for death. My dad did a study on depression using Elijah as an example and noted the first thing God had him do was get rest and eat, taking care of the physical side. After that Elijah was strengthened. Another lesson is when Elijah panicked and said, they killed all the prophets, and I’m the only one left! Sometimes I think we can exaggerate things feeling like we are alone in this. Like, ‘its just me God, everyone else has abandoned You’. God corrected him…no, there are seven thousand others who have no bowed to Baal. Elijah is one person I can sure relate to!! So I don’t care if commentators criticize him, he was human and not perfect. I love how the people where in prayer for Peter and even when he was rescued and showed up at the door they themselves didn’t believe! I think we have all gone through this perhaps…God answers a prayer and we think, no, there’s no way. We doubt! We lack faith! Yes, I think the psalmist is trying to say His love endures forever ;) (or His mercy as NKJV says). 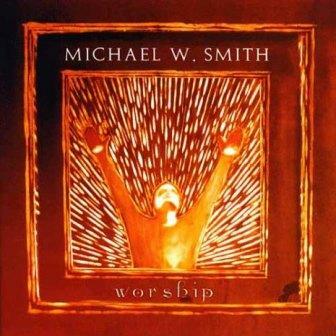 I’m singing Michael W Smith too!